Gerald (Jerry) Estrin, a professor emeritus at UCLA who worked as a research engineer on one of the earliest computers, died March 29 at his home in Santa Monica at age 90. Many of the pioneers of the Internet were among his students and colleagues. In 1954–5, Estrin led the development of WEIZAC, the first large-scale electronic computer outside of the United States or Western Europe, under the auspices of the Weizmann Institute of Science in Israel, where he served as director of the Electronic Computer Project. 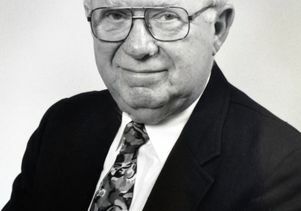 A native New Yorker, Estrin was educated at the University of Wisconsin, where he received bachelor's master's and doctoral degrees in 1948, 1949 and 1951, respectively. In 1950–56, he served as a research engineer in the John von Neumann group at the Institute for Advanced Studies in Princeton, N.J., where he worked on one of the earliest computers. Estrin and his family left for Israel in 1954 to lead the development of the first computer in the Middle East. But the challenge was complicated by the fact that the project had no staff, no parts and no tools, Estrin told the Canadian Jewish News in 2004. "My first priority was to hire a staff and then train them in the redesign, testing and fabrication of the computer," he told the reporter. But expertise was scarce. To produce the extremely thin copper strips they needed, the computer group found two Bulgarian immigrants who made parts for fans and bicycles in a shack surrounded by farm animals. They were able to use their stamping machines to manufacture the strips. Just 15 months after Estrin arrived in Israel, the computer began to function. "The WEIZAC project drove me to make a contribution beyond my dreams," he said of the achievement that launched Israel into the computer age. Estrin joined the UCLA faculty in 1956, became a founding member of the computer science department and served as its chairperson from 1979–82 and from 1985–88. His wife of 70 years, Thelma Estrin, a professor emerita at UCLA, is in the same department, as is their daughter Deborah Estrin, a professor and founding director of the UCLA Center for Embedded Networked Sensing. Among Estrin's many academic accomplishments was developing the concept of reconfigurable computing, an idea that led to new types of programmable computer chips that are part of many of the systems and devices in use today. "Jerry was truly a giant in computer science, as his contributions and influence to the field were both broad and deep," said Vijay Dhir, dean of the UCLA Henry Samueli School of Engineering and Applied Science. "Jerry has left a lasting legacy of excellence in scholarship, teaching and innovation. We have been friends for many years, and I'm saddened to hear of his passing. On behalf of the school, I'd like to express my deepest condolences to his wife, Thelma; daughters Margo, Judy and Deborah; and his grandchildren." Colleagues said Estrin touched many lives through his guidance, teaching and research and that he will always be remembered for his inspiration, commitment to excellence and challenge of conventional wisdom. Estrin was an IEEE Fellow, a Guggenheim Fellow and a member of the board of governors of the Weizmann Institute of Science. Until his final days, family members said, he remained an avid fan of the UCLA Bruins basketball team and the Metropolitan Opera and enjoyed taking walks along the beach. Estrin is survived by his wife, Thelma; daughters Margo, Judy and Deborah; and four grandchildren.